3 feet PVRES overhang on right. In Florida "Cracker" homes, built at the turn of the century before air conditioning, wide porches and deep overhangs were considered essential to achieve comfort. However, with the advent of air conditioning, many new homes have sacrificed overhangs in interest of first cost. New residences in modern developments often have practically no overhangs. For solar control on walls and windows, the PV home has a 3 foot overhang around the perimeter of the building while the standard home has one and a half foot overhang. Figure 1 shows the shade line difference produced by such an overhang. 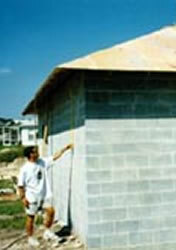 In the photos taken during construction, project engineer John Sherwin measures the length of the overhang shadow along the south wall of the two homes at 11:10 AM on October 1st, 1997. The standard home, shown on the left, with a 1.5 foot overhang casts a shadow length of just 36 inches - barely enough to reach the tops of the window. At the same time, the shadow cast on the PV home is nearly 72 inches long. The overhang shades most of the wall and at least 75% of the south and east window area. Figure 5 shows the impact of the overhang as seen from an interior thermograph of a west window. The cooler upper shade line is clearly visible. Figure 5. Impact of shade land on west window of Control home. Upper portion is shaded, lower is not. IR thermograph illustrates impact on cooling load. 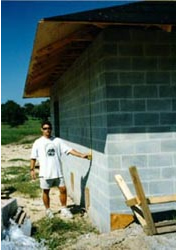 In conventional residential construction in Florida, walls are insulated with R-3 to R-5 ft2 · h · oF/Btu insulation on the interior of the masonry walls. Although, this may seem low relative to building practices in northern climates, previous field monitoring has shown that a insulation can only reduce space cooling by 5-10% in Florida's climate . The most common wall insulation system in Florida to meet the insulation requirement is a layer of foil (Fi-foil Reflective Insulation) suspended between interior furring strips with an equivalent insulation value of R-4.2. Figure 6 shows the interior east wall of the control home in the early afternoon. The effectiveness of the Fi-foil is seen with the fact that the furring strips are warmer than the low emissive surface in between. Figure 6. 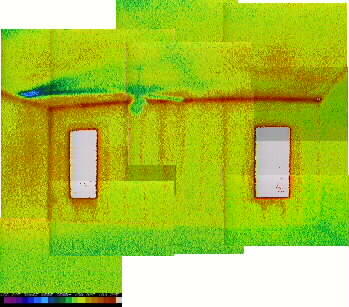 Interior thermography of east facing wall in Control home. Heat gain from windows is obvious as well as the effectiveness of foil insulation between studs. However, the concrete block walls of the PVRES home were better insulated on the exterior both in order to assist with reducing the cooling system size and to help with the load shift objective within the project. The Celotex Corporation supported the project by providing 1¼" Tuff-R C isocyanurate insulation and worked with the builder to resolve issues associated with the unusual application (Figure 7). Figure 7. 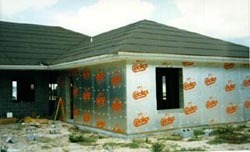 Exterior R-10 isocyanurate insulation used on PVRES home. An exterior application was used to encapsulate the building in R-10 insulation so that the masonry portion of the building could be pre-cooled during the daytime hours when solar availability is high and the PV system output is at its maximum. The intent was to utilize the thermal capacitance of the building and its masonry to help to reduce air conditioning needs during the late afternoon and early evening hours. Windows are known to be the large source of cooling loads in Florida residential buildings. Generally, a low Solar Heat Gain Coefficient (SHGC) is needed to keep out the sun's heat, and a low conductance or U-value (Btu/hr-sqft-oF) is important to reduce the design cooling load. The most common windows used in Florida homes do not well meet these needs. Typically, windows are single pane clear glass with aluminum frames (SHGC = 0.875, U = 1.1). For the PVRES home, we attempted to locate a superior product. However, simply a low SHGC could not be the sole objective; very low solar heat gain values can indicate windows with a dark tint that transmit very little visible light. This can reduce daylight to an extent that occupants have to use electric lighting to supplement interior light levels. Physical appearance was also considered important; this generally excludes either dark tints or reflective products which give the outside of the building a mirrored look. For the project, we chose a spectrally-selective glazing. This refers to a window unit which transmits much of light in the visible portion of the solar spectrum, but limits transmission in the infrared and ultraviolet portions which cause overheating and fading of interior materials. We selected PPG Industries' Sungate 1000 solar control, low-E glass product with Argon gas fill. As shown in Table 2, this product has a SHGC of only 0.38, but with a daylight transmittance of 73%. The center-of-glass U-value is 0.24 Btu/hr · ft2 oF; we reduced heat transmission through the window frame by specifying white thermally broken vinyl frames (overall U-value = 0.35). The improved glass has major implications for the required size for the air conditioning system. With 384 square feet of glass in our floor plan, Manual J showed a 7,700 Btu/hr difference (0.64 tons) in the required size of the air conditioning system - a large reason we are able to use an air conditioner half the size of that in the standard building. The windows provide excellent daylight transmittance as well as providing a color neutral appearance. Most visitors examining the PVRES home were unable to discern any visible difference in the appearance of the windows either from inside or out. 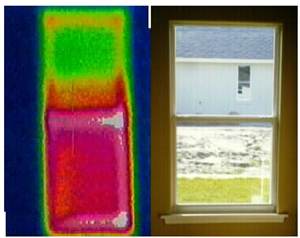 However, the difference in the transmitted heat is clearly seen in the thermographic comparison shown in Figure 8.
west-facing Control (left) and PVRES windows (right). Over the last five years, FSEC has conducted numerous residential experiments showing that white roofs can reduce cooling energy needs . The average cooling energy reduction based on tests in a dozen homes converted to white roofs was 19%. Based on testing performed at the FSEC's Flexible Roof Facility in the summer of 1997, we learned that of the evaluated roofing systems (radiant barriers, added ventilation, white tile and white metal roofs), white tile provides the best cooling related performance of tested options . Relative to a black asphalt shingle roof, a white tile roof produced a 76% reduction in overall summer ceiling heat flux (all test cells have R-19 ceiling insulation present). Moreover, when the outside summer air temperatures were at their peak the coincident peak attic air temperature difference which was 40oF lower in the white tile test cell (91.4oF) than the construction with black asphalt shingles (131.5oF). The measured attic air temperature is actually lower in the attic than the ambient air temperature until 2 PM in the afternoon on a typical summer day! Both our test homes have R-30 fiberglass insulation blown in the attic, but two major differences for the PVRES home. The improved house features a white Mission concrete "S" tile roof - donated to the project by the Monier Company - to take advantage of its superior thermal performance. The control home's roof is conventional: popular gray-brown asphalt shingles. We had both roof materials evaluated by DSET Laboratories; the solar reflectance of the Monier white S-tile tested at 77% while the reflectance of the gray-brown architectural asphalt shingle was only 7%. Figure 9. Comparative visible and thermographic images of the Control and PVRES home roofs. The tile roof was installed on the PVRES home in January of 1998. As expected, infrared thermography of the roofs (Figure 9) revealed major differences in the thermal performance of the two roofs. Figure 10 shows a plot of the measured attic air and ambient temperatures in the two homes on the utility peak day of June 18th. The attic temperature in the control house rises quickly in the afternoon to reach a maximum of 137.9oF at 2:30 PM while the white tile roof attic only reaches 100.2oF - just about the same as the ambient air temperature. and PVRES homes on the utility peak day (June 18, 1998). An innovative design feature in the PV home is its low-friction interior mounted duct system. 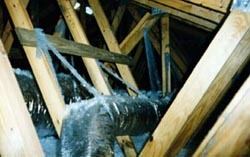 In conventional houses (including our standard home) the ducts are frequently undersized and are almost always located in the hot attic (Figure 11). Previous research has shown that air handlers located in the attic space can increase space cooling by up to 30% . Tests at FSEC has shown that not only does the attic sometimes reach 135oF in Florida's summers , heat transfer to the duct system can rob the air conditioner of up to a third of its cooling capacity during the hottest hours. The reason is simple: R-6 flex ducts contains the coldest air in the home (~60oF) while being exposed to the hottest temperatures; the area of ducts in a typical home is a third of the floor area. Heat transfer is proportional to surface area, thermal resistance and temperature difference: Q = UA (delta)T. At 130oF, and a 2,400 square foot home, this equates to over half a ton of air conditioning lost before cooling air reaches the registers. houses duct system in PVRES home. To avoid this problem, and to allow down-sizing of the PVRES air conditioning system, we designed the duct system so that it fits inside the conditioned space. Whatever heat is gained by the duct system is heat to be removed from the conditioned space. To hide the ducts, false dropped ceilings, lower cathedral sections and chases were used throughout the interior (Figure 12). To avoid problems with leakage, the duct system was carefully sealed with mastic and tested. Finally, we oversized the duct system, so that air flow resistance would be minimized. This not only provides critically important air flow across the evaporator, it also reduces air handler fan power and improves system efficiency while lowering noise. Such high air flow, low friction duct systems have shown to provide up to a 12% improvement in cooling system efficiency at essentially no cost . Duct slide rules dominate the air conditioning industry with 0.1 inches water column (IWC)/100 ft equivalent length almost universally used to size ducts. Based on previous work, we found that using a friction coefficient of 0.05 IWC/100 ft will achieve the proper system air flow. A balometer mounted on the AH return air grill was used to verify that the target air flow was achieved (700 cfm/ton at full fan speed).